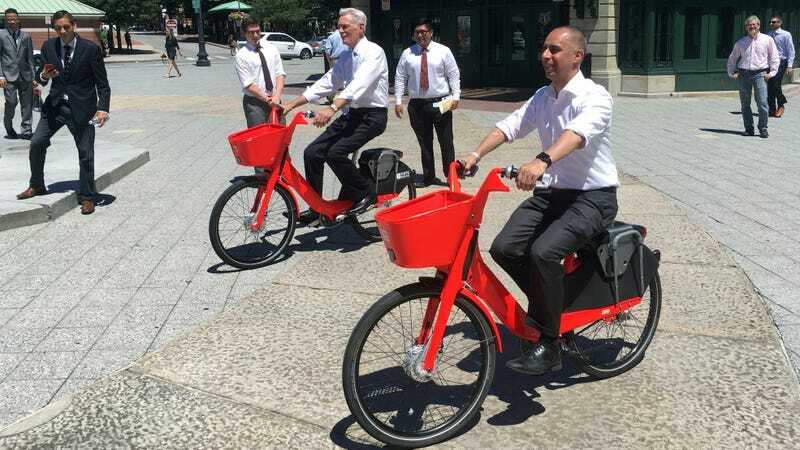 Mayor Jorge Elorza, right, riding an Uber Jump bike with Tufts Health Plan CEO Tom Croswell in in Providence, Rhode Island in July 2018. Uber—the company that had to pull its self-driving cars off the road for most of 2018 following a lethal accident that allegedly came after warnings of routine accidents—is hiring for a program that may work on self-driving “micromobility” devices, TechCrunch reported on Sunday. Details are, as TechCrunch noted, “scarce,” but there’s a lot of speculation that Uber is investigating autonomous versions of the scooters and bikes of the short-term rental type that have already taken over many major cities. The Telegraph reported that Uber has begun hiring for the Micromobility Robotics team, which it wrote had the goal of developing scooters and bikes that can drive to charging stations themselves, or possibly to go and pick up riders after the prior passenger disembarks. The New Mobilities team at Uber is exploring ways to improve safety, rider experience, and operational efficiency of our shared electric scooters and bicycles through the application of sensing and robotics technologies. Self-driving scooters would be a big game-changer for Uber. It already has a fleet of electric bikes and scooters under its Jump division, but like competitors Bird and Lime (the latter of which Uber owns a minority stake in) the logistics of using a small army of contractors to pick up the scooters after rides are already a major money-burner. Moreover, the companies haven’t been great about managing them. Both Bird and Lime were restricted from doing business in San Francisco after launching without permits and leaving scooters everywhere, and locals in West Coast cities reportedly waged a sort of guerilla vandalism campaign against them in 2018. As TechCrunch noted, Uber Jump recently unveiled a series of upgrades to give some of its bikes “self-diagnostic capabilities and swappable batteries,” designed to minimize downtime. Self-driving scooters are an obvious way to further streamline the business. On the other hand, given that Uber and its competitors have already run into major safety issues with self-driving cars, it’s hard not to be somewhat worried about an army of self-driving scooters hitting the roads and sidewalks of U.S. cities, intermixing with pedestrians and vehicular traffic. Reports have suggested human-piloted ones available right now have generated a growing number of injuries, and there have been serious glitches with some models. (Jalopnik’s Bradley Brownell took some Bird scooters for a ride in early 2018, finding that some had faulty brakes.) Nor would anyone probably feel alone in that concern: A poll conducted in January 2018 found just 27 percent of respondents would feel comfortable in a self-driving car. That said, Uber hasn’t confirmed that this is what the Micromobility Robotics team will actually be doing, and given that hiring has only just begun, it’s a safe bet that self-driving scooters won’t be hitting the road anytime soon. Perhaps autonomous bikes and scooters would also raise eyebrows among transportation regulators that already have a sour taste in their mouth from the fiasco in 2018. Then there’s another issue: Unless these bikes and scooters are capable of picking themselves up when left sideways on the ground, this won’t eliminate the need for all those contractors. Uber did not respond to a request for comment from Gizmodo for this story, but we’ll update if we hear back.